Veenite: Mineral information, data and localities. Bulk composition of SXRD-analysed sample (Topa & Makovicky, 2017) is: Ag0.15Pb16.029Sb8.836As6.99S39.95. Named after Rudolf Willem van der Veen (January 27, 1883 Buitenzorg Java - April 6, 1925 Gravehagen), metallographer and mining engineer. Sartorite homologue, N = 4; the structure is based on zig-zag walls of prismatic Pb; these walls separate slabs comprising diagonally-oriented double layers containing Sb and As, and some Pb. Orientation of three-membered crankshaft chains containing (As,Sb)–S is substantially different from that in dufrénoysite. Data from Topa & Makovicky (2017). Orthorhombic pseudocell with a' = 0.5a = 4.22, b = 26.2, c = 7.90 Å. Space group of the pseudocell is P21cn or Pmcn. The X-ay powder pattern closely resembles that of dufrénoysite. JAMBOR, J.L. (1967): New lead sulfantimonides from Madoc, Ontario. 1. Canadian Mineralogist 9, 7-24. JAMBOR, J.L. (1967): New lead sulfantimonides from Madoc, Ontario. 2. Mineral descriptions. Canadian Mineralogist 9, 191-213. JAMBOR, J.L. (1968): New lead sulfantimonides from Madoc, Ontario. 3. Syntheses, paragenesis, origin. Canadian Mineralogist 10, 507-521. Walia, D. S. & Chang, L. L. Y. (1973): Investigations in the systems PbS-Sb2S3-As2S3 and PbS-Bi2S3-As2S3. Can. 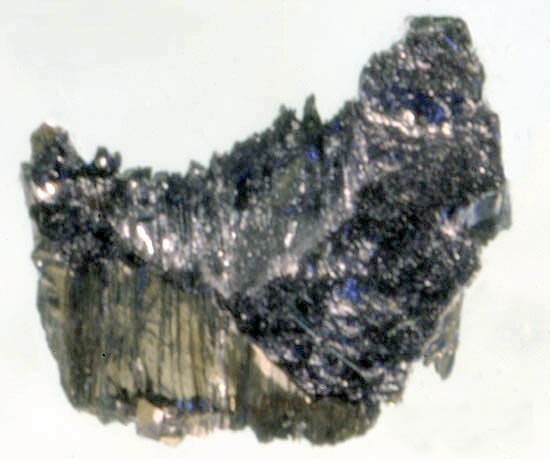 Mineral., 12, 113-119. JAMBOR, J.L., LAFLAMME, J.H.G. & WALKER, D.A. (1982): A re-examination of the Madoc sulfosalts. Mineralogical Record 13, 93-100. Topa, D. & Makovicky, E. (2017): The crystal structure of veenite. Mineralogical Magazine, 81, 355-368. JAMBOR, J.L. (1967): New lead sulfantimonides from Madoc, Ontario. 1. Canadian Mineralogist 9, 7-24. JAMBOR, J.L. (1967): New lead sulfantimonides from Madoc, Ontario. 2. Mineral descriptions. Canadian Mineralogist 9, 191-213. JAMBOR, J.L. (1968): New lead sulfantimonides from Madoc, Ontario. 3. Syntheses, paragenesis, origin. Canadian Mineralogist 10, 507-521. JAMBOR, J.L., LAFLAMME, J.H.G. & WALKER, D.A. (1982): A re-examination of the Madoc sulfosalts. Mineralogical Record 13, 93-100.
ⓘ Hoffnung Mine (Spes Mine) ? Camprubi, A., Canals, A., Cardellach, E., Prol-Ledesma, R.M., Rivera, R., 2001, The La Guitarra Ag-Au low-sulfidation epithermal deposit, Temascaltepec district, Mexico: vein structure, mineralogy, and sulfide-sulfosalt chemistry. Society of Economic Geologists Special Publication, v. 8, p. 133-158.
http://minerals-of-the-carpathians.eu; Cook, N. J. & Damian, G. S. (1997): New data on "plumosite" and other sulfosalt minerals from the Herja hydrothermal vein deposit, Baia Mare district, Rumania. Geologica Carpathica 48, 387-399. Martínez-Frías, J., Lunar, R., Rodríguez-Losada, J. A., Delgado, A., & Rull, F. (2004). The volcanism-related multistage hydrothermal system of El Jaroso (SE Spain): Implications for the exploration of Mars. Earth, planets and space, 56(7), v-viii.